High standards are required from all who study for the SATRA footwear technician award. 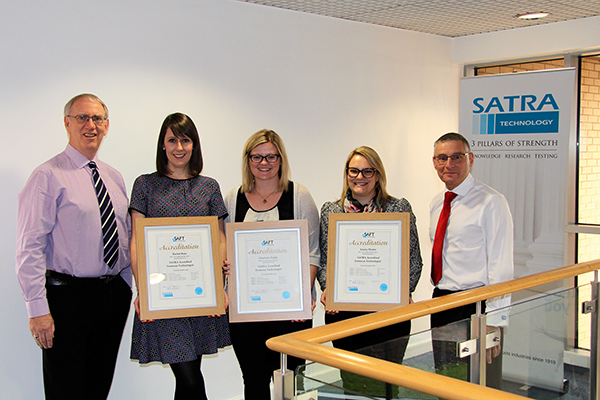 SATRA is delighted to have presented the highly regarded SATRA Accredited Footwear Technician (SAFT) award to Rachel Rees, Louise Dexter and Charlotte Fowle. They now join a select group of successful students who have achieved this internationally recognised accolade. The SAFT course teaches six key areas in footwear production: lasts and fitting, materials and constructions, laboratory test procedures, product design and lean manufacturing, quality assurance and performance/risk assessment, and industrial footwear. Students select five of these modules, and an examination pass in each of the chosen subjects is required to gain SAFT accreditation. Rachel Rees is employed by footwear sourcing company FT International. The company – which was founded in 1986 – has always focused on Asia, and now particularly sources in China and Vietnam. FT International mainly supplies vulcanised footwear, cemented trainers, EVA sandals, leather casuals and boots, slippers, and PU and leather formals. With FT International offering a full service from design to delivery, Rachel works on development and risk assessment of footwear for one of the company’s major high street customers. “Not coming from a footwear background, I wanted to learn more and really enjoyed a couple of short courses that I attended at SATRA,” she said. “One was an overview of testing and the other was on REACH. FT International recognised my interest and enthusiasm, and supported me in studying for the SAFT qualification. Louise Dexter has worked in the footwear industry for 13 years. She began her career in a factory in South Africa as an assistant design/developer, and today is product development manager at Wolverine Worldwide, working for the Cushe brand and based in the London office. “I decided to do the SAFT course because although I have a fair amount of experience in the footwear industry, it is more development focused and the course offered a wide range of subjects. I felt it was important to have an accreditation to my name,” said Louise. Charlotte Fowle chose to challenge herself to take the SAFT course in order to increase her knowledge of shoemaking and the footwear industry in general. Having graduated from university shortly before starting work at SATRA, Charlotte thought that she would enjoy no longer having to study. “In fact, I missed learning,” she confessed, “and so taking the SAFT course was an excellent opportunity to continue to challenge myself and continue learning on a topic which would also benefit my knowledge at work. It was hard to balance my workload with revision and additional reading, but that also allowed me to develop my skill of time management in order to achieve results that I was happy with. Please email training@satra.co.uk for more information on the SAFT award and further training available from SATRA. This article was originally published on page 38 of the January 2015 issue of SATRA Bulletin.